Responsible use of fire - Sail in Finland! 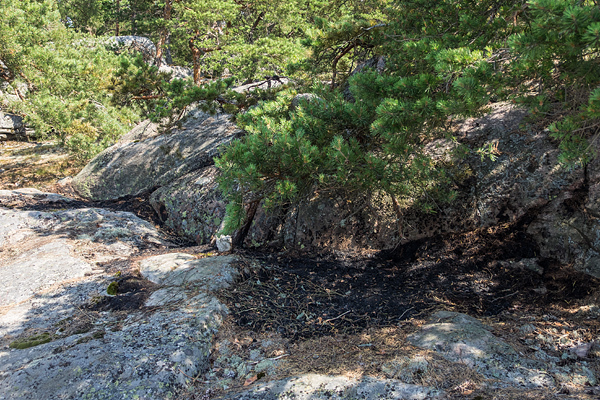 Unfortunate example of irresponsible use of fire: coal from a grill has caused a ground fire that could easily have turned into a major forest fire. 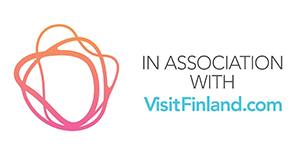 The “Everyman’s right” in Finland gives locals and tourists alike access to the fantastic nature in Finland. You are quite free to roam the country with a boat or on foot and enjoy the best that the Finnish nature has to offer. One of the most prevalent misconceptions of the everyman’s right is that it allows the use use open fires. This post provides some insight into the responsible use of fire in accordance with the everyman’s right. You might think that a small island surrounded on all sides by water would not be very sensitive to fires. As far as the Finnish archipelago is concerned, this is not the case. 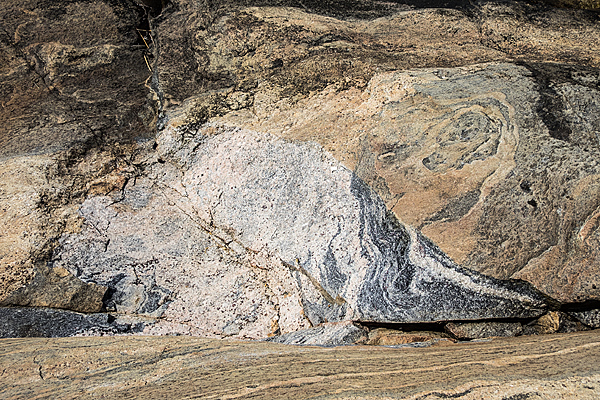 The ground often consists of rock or gravel covered by just a thin layer of vegetation. This vegetation dries very quickly in good weather and becomes very inflammable. Also the trees are often old with lots of dry branches which burn easily. Not only is the environment very sensitive, help is also very far away. If a fire starts on an island in the archipelago, it can take many long hours before help arrives. A small ground fire can still be put out with some buckets and water, but if the fire catches on in the trees, only professionally equipped firefighters are able to put it out. It is therefore very important that everyone pays special attention and uses fire carefully and responsibly when moving about in the archipelago. 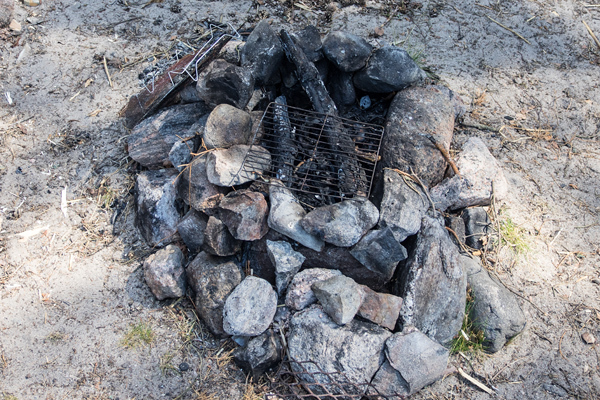 A typical fireplace found in many harbors. In many harbors, the harbor owner maintains a fireplace for the visiting boaters. In these cases it is quite obvious that you have the (implicit) permission of the land owner to light a fire in the fireplace (but nowhere else!). The situation gets a bit murky for instance in natural harbors where you often find fireplaces of various quality. The custom in Finland (but not necessarily supported by the law) is that people do use these fireplaces. What is clear not permitted is to make landfall on an island and then put up a bonfire on the shore. Even if you have the permission to lite a fire, the everyman’s right does not give the permission to fell trees or break of branches as firewood. You may only use branches that have fallen on the ground, driftwood found on the beach or wood provided by the owner of the fireplace for the fire. Do note that some of the driftwood you might find is impregnated wood (easily recognized by its greenish color), often originating from a nearby jetty that has suffered an injury during the winter. In Finland impregnated wood is considered problem waste and must not be burnt. It also gives of poisonous fumes so there is a good reason for not using it in your fire. Also note that it is forbidden to dispose of garbage by burning it. Garbage must always be deposited in garbage containers or other appropriate places. How do you know if there is “an obvious risk of forest fire” mentioned in the rules? Easy! 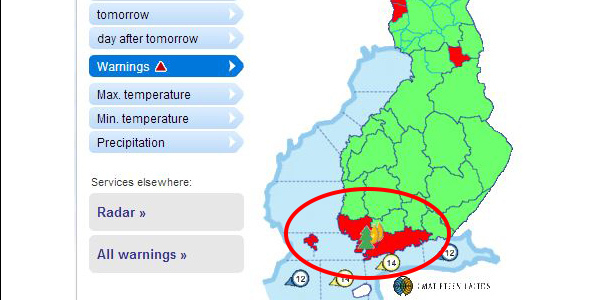 The Finnish Meteorological Institute (FMI) can issue a forest fire warning as part of their weather forecast. You can easily check whether such a warning is in place from the FMI warnings page. If such a warning is in place in your area, then the use of all open fire is strictly forbidden. A forest fire warning is in place in the encircled area (as indicated by the burning tree). 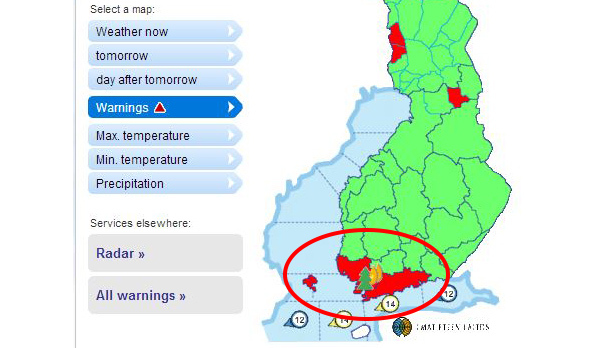 Even though the archipelago does not appear in red, the warning also applies there. What is not only forbidden but also highly damaging to the highly sensitive archipelago environment is lighting a fire on a cliff along the shores. Unfortunately, many badly informed people think that the cliff is a safe place for light a fire when in fact it leaves a permanent mark. If you light a fire on a cliff, the heat will make the rock material expand and the contract quickly as the rock first heats up and then cools down. This makes the rock crumble and break off and leaves ugly scars on the cliff that will stay there for hundreds of years. You don’t want to leave scars like this behind you for hundreds of years from just having a single fire on a cliff, do you? If worst comes to worst, act quickly and responsibly. First call for help. The general emergency number in Finland is 112. The operator speaks English most of the time. When calling for help, make sure you have the co-ordinates of your location. Many islands have names that are far from unique and islands with the same name can exist even quite close to each other. The coast guard also has fire prevention equipment. You can call them on the coast guard’s emergency number: 0294 1000. Note that this is a number that mobile phones will recognize as an emergency number so cannot call this number from a lock mobile phone or from a mobile phone without a sim-card.